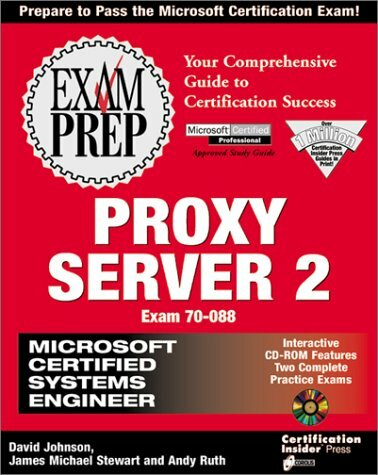 MCSE Proxy Server 2 Exam Prep provides the most extensive, detailed information and advice available for aspiring MCPs and MCSEs to help them pass Exam #70-088, Implementing and Supporting Microsoft Proxy Server 2.0. Written in the popular Exam Prep style, this book includes explanatory information, sample questions, reviews of terminology and tools, and resources for additional reading and study. Covers critical topics in the detail needed to pass the certification exam, including architecture, client capabilities, installation and configuration, managing and tuning, security, managing resource access, Internet access and deployment, managing multiple servers, and troubleshooting. Andy Ruth, MCSE, MCT, teaches Microsoft Certified classes on Windows NT Server, NT Workstation, and other Microsoft BackOffice products for Productivity Point International. David Johnson (Austin, TX), MCSE, is a manager at a computer and network services company. He has written 12 books centered around Microsoft and Novell certifications. James Michael Stewart is the "handler" for an NT Forum on the Softbank Forums Web site, and the leader of the NT Study Group for the Central Texas LAN Association, and co-author of several books. All authors reside in Austin, TX.